Bruce Boudreau must be wondering where this Washington Capitals team was the first 25 games of the season. Two power play goals, scored quickly into the first shifts of each, and some stellar goaltending by Tomas Vokoun led the suddenly resurgent Capitals to their fourth straight victory, this time over the visiting Calgary Flames, 3-1, before a Tuesday night sold-out house at Verizon Center. The game also marked the return of defenseman Mike Green, back from the reported groin injury that shelved him for all but eight contests this season. Green, who declined to give himself a grade for his evening’s performance, skated 17 shifts and logged 15:43 of ice time, only 43 seconds of which came on the power play. He did not register a shot on goal, had two other shots blocked, and was credited with three hits and two blocked shots. The power play, which had been truly dreadful for much of the season, was functioning properly last night. A mere 35 seconds after the Flames’ Rene Bourque was sent to the penalty box for holding, just 1:11 into the game, the Caps lit the lamp, with a classic Alex Ovechkin one-timer from the left wing face-off dot. He was given the perfect pass from Marcus Johansson, who took a feed from Nicklas Backstrom (three assists), then started a move to the high slot, which drew the defense from away from Ovechkin, leaving one of the league’s most dangerous shot wide open. The goal (17) was Ovechkin’s seventh in as many games (seven goals, four assists), and his assist later gave him multiple points in four straight. Where the first power play goal was of the “pretty” variety, the second one was “dirty”. 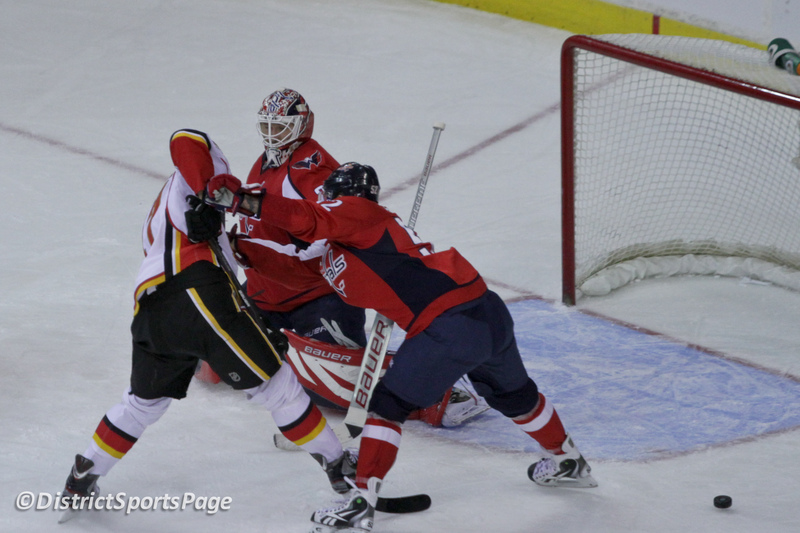 Ovechkin unleashed a shot form the point that Flames goalie MIkka Kiprusoff (18 saves) knocked down. But Troy Brouwer (11) was camped out in the crease, and stuffed the puck under Kiprusoff’s pads before he could recover from the first shot. Not all the news about Backstrom was good, however. Mid-way through the third period, Bourque leveled the Swedish pivot with an elbow to the jaw, earning an elbowing penalty and sending Backstrom from the game. Hunter was unclear if Backstrom was taken to the league’s mandated “quiet room” for evaluation during the game, but the coach did indicate that Backstrom was being evaluated this evening as a result of the hit and more would be known about his condition Wednesday morning. Backstrom was not available to the media following the game. Dennis Wideman capped the scoring late in the second, with a blast from the right wing face-off circle off another great play by Backstrom, who held the puck long enough along the goal line to draw the defense, which created space for the charging defenseman. It was Wideman’s seventh goal of the season, and Backstrom’s 29th helper. The win moves the Caps back into a playoff spot, tied with New Jersey with 44 points for the last two spots in the conference, with Winnipeg and Toronto just a point behind. But it also inches them a couple of points closer to Division leading Florida, who now sit just three points ahead of the Caps. The Caps put themselves behind the eight-ball this season with their lackluster play early, and every point in the standings is going to be crucial from here until April. CAPS NOTES: The Capitals blocked a season-high 24 shots. Washington outshot Calgary 21-19 and won 63 percent of the face-offs. Vokoun has won four straight, and given up just five goals in those four games. He recorded 18 saves, including several spectacular stops when the game was still tied in the second period. Backstrom has eight points (one goals, seven assists) in a current five-game point streak. Johansson has one goal and three assists in his last four games. Photo gallery from last night’s game.